Honest disclosure: I had every intention of finally investing in a webcam/microphone for this week’s post, but I get anxious when dealing with purchasing a new electronic (a silly analysis paralysis), so I put it off and here we are. On the bright side, I have finally read every review for every webcam/microphone combination in existence. So, instead of providing you with a wonderful video tour of my bleak Canvas page, I am going to have to use screen shots to guide this post. Another honest disclosure: online presence in my F2F courses has always been rather minimal, so my Canvas page is pretty barren. Home Page: Believe it or not, the above photo is actually an improvement for this semester. This is my first semester using Canvas, and I used to just have an empty landing page on my prior Blackboard page. Once again, the online community in my class has always been supplemental. Essentially, the online aspect of my course was just to send out emails, collect assignments through Turnitin and post files. Canvas has really pushed me into thinking about a more serious integration. 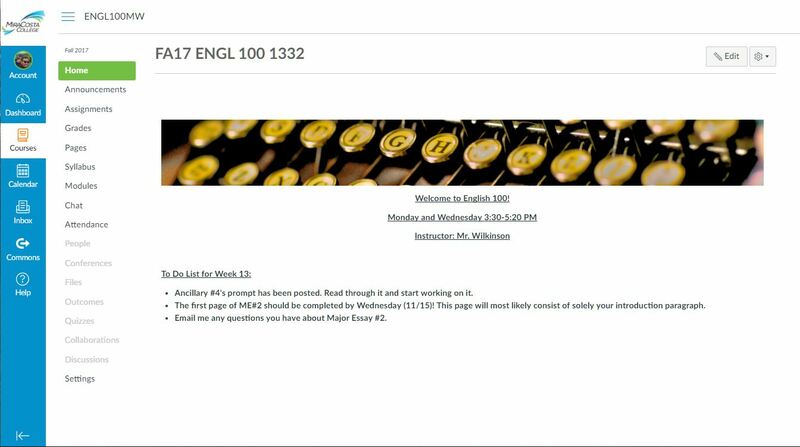 Announcements: I have started utilizing the announcement section a lot more this semester due to the Canvas App. Most of my students use the Canvas app on their phones, so sending out announcements is the fastest way to get my students information. Modules: I started this semester by reorganizing my modules at my students’ request. I used to have these sections organized by types (prompts/readings/submission links), but students asked for them to be organized on a week-by-week basis. In the end, this reorganization has definitely worked for the better. Get a webcam/microphone, and utilize more video feedback/discussion. Polish my home page to utilize links (much like the Writing with Machines page). I think this is the one I am most interested in as it seems like any way to consolidate and streamline is beneficial (especially with the push to the Canvas App). Utilize the syllabus section of the website and move away from just posting the .pdf. It is ironic that feedback is the discussion topic for this week as I am using this discussion to take a much needed break from grading. I had a very difficult time with grading my submissions through Canvas as I did not know I could still grade through Turnitin’s feedback center (where my comment bank lives), so I had to type out all of my comments in canvas and did not realize my mistake until half way through my second class, but it was too late. However, one of the positives of this mess up is that it did allow me to rethink my comment bank. I was part of an online feedback learning community at CSUSM a few years ago, so I have a comment bank I have been using for a while. While that has seemed to serve me well the last couple years, I do worry about the comments not being…. Legitimate? I am blanking on a good word to choose here, but “cookie cutter” comes to mind as well. A comment bank is obviously extremely helpful for in-text comments, but I do worry that a student could see those cut and paste comments as laziness on my end. I give a decent end of paper summary/response/justification which tends to be more personal and specific, but there is also the issue of managing time. What good is a page of feedback if a student is not getting it back in time to use on his/her next paper? So I can see how the comment bank is good, but I worry about how impersonal it may sound. Honestly, I would prefer to grade all of my papers by hand as I love to use symbols/shorthand to help speed the process along, but the logistics of managing/handling 100+ physical papers make me nauseous. If, or when, I transfer into the OWCourse, I definitely foresee using the video/voice comment tools. I love discussing a student’s paper face to face during office hours, and while a video comment section won’t necessarily be synchronous, I imagine it could produce a more authentic discussion on my end. My voice/face in conjunction with those dangerous, bordering on cookie cutter, comments/annotations could fix my worry about sounding lackadaisical. I think it would be helpful to reinforce the idea of reading/responding to a paper out loud as opposed to just skimming it. Students could hear their errors, and would hopefully see the benefit of breaking away from the screen for the revision process. I am also very intrigued with the peer-review section Warnock discussed as online peer feedback is something I am trying in my f2f course this semester (with the help of Google docs). While I would love to eventually cobble together something like Chad’s video response activity for peer feedback, I am fascinated to see how taking the peer review discussion online is going to pan out. In the end, I think the concept I am most excited for when it comes to feedback is to make the process less digital and incorporate more of my lovely face into the mix (with the help of the best webcam money can buy).